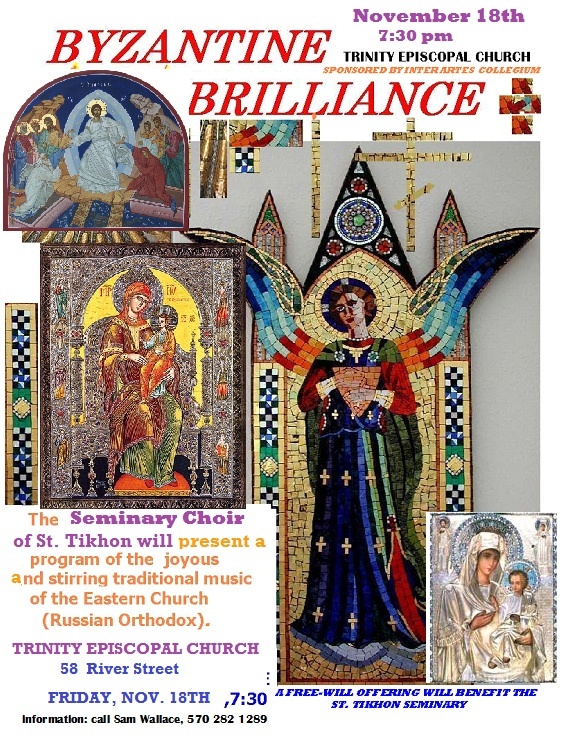 On Friday, Nov. 18th, the St. Tikhon's Seminary Mission Choir will be featured in a production called Byzantine Brilliance to be held at Trinity Episcopal Church, 58 River St. Carbondale PA. 18407. This event is sponsored by the Inter-artes Collegium and is being promoted by the Carbondale Chamber of Commerce. This promises to be a very well attended event so make your arrangements early. For more information please contact Sam Wallace 570-282-1289. Donations to help support St. Tikhon's Seminary will be collected at the time of the event. If you are able please come to help support theological education and the St. Tikhon's Community.